Outstanding performance with 2D barcodes decoding capability. 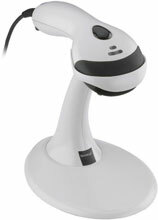 The Metrologic MS9524 Voyager PDF scanner offers outstanding performance in all PDF417 barcode scanning applications. What differentiates the MS9524 Voyager PDF scanners is the ability to decode 2D codes such as PDF417, PDF417 truncated, micro PDF417, macro PDF417 and RSS-14 composite barcode symbologies. It features automatic trigger operation, bright easy to see, easy to aim laser line, user-replaceable, single cable interface to host and an adjustable stand with auto stand detect. The MS9524 Voyager PDF is ideal for menu-scanning, pick-list and point-of-sale applications. The Metrologic MK9524-32A38 is also known as Metrologic Instruments	MET-MS9524-32A38	or MK952432A38	.